One of my homework assignments for class was to draw a rough floor plan of my kitchen as it currently is and another of what it would look like if I could redesign it. This was a great assignment for me because I want to redesign our kitchen at some point, but it's last on the to-do list. Clearly the previous owners have updated it since 1978 and everything is really great quality, it's just not our style. I dream of white cabinets, stainless steel appliances, gray marble or granite countertops, a new backsplash, range hood, flooring and lighting fixtures. 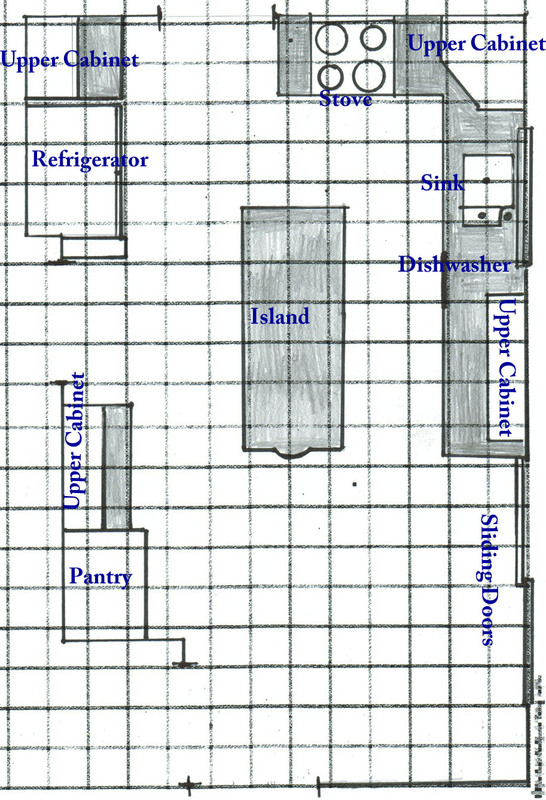 All of that would be wonderful, but my biggest pet peeve about the kitchen is not necessarily the decor, but the layout. See that island there. Islands are great, right? Yes, they are, but not in this kitchen. My guess is the previous owners wanted an island so badly that they did what they could to squeeze it in, but it really doesn't fit. At all. If you open the dishwasher, or the trash cabinet, someone can't get by. If you open the oven, someone can't get by. I can't stand on the left side of the dishwasher and unload the glasses to the upper cabinet on the right side without a) closing the dishwasher or b) walking around the island. And, there's no room for seating at the island, except for one seat at the end. There's some room for a small table in front of the sliding doors, but we haven't found anything we like that won't make it feel really cramped. I've since learned that there should be 42" between the counter and the island so that people have space to walk through. We have 31.5". Must be why we're feeling cramped. You should also leave 30-48" in front of appliances so the doors can be opened and you can walk in front of them. Hmm, that's our other problem. When the stove is open, we have 12" and when the dishwasher is open 5" or 6" if I'm being generous (it's running now so I can't check). What do you think? I think it solves the space issues we've been having and gives us a place to eat in the kitchen. Let's talk budget. 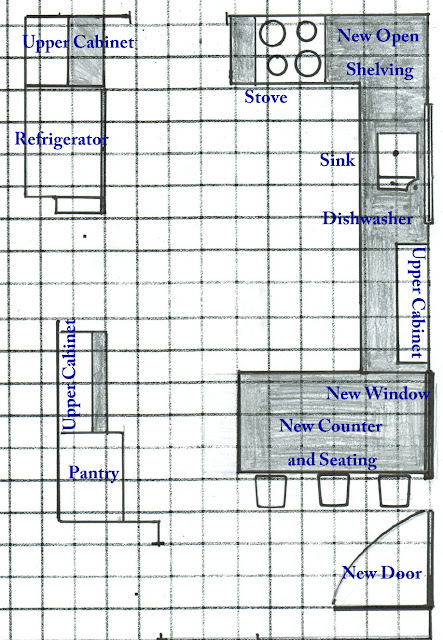 Realistically, I have no idea how much this would cost, but I'm hoping the whole project could be done for $15k - $20k (this includes replacing flooring and appliances, painting existing cabinets white, replacing countertops and backsplash, adding new cabinets for breakfast bar, and changing the sliding doors). I might be living in la la land, but we'll see. I'm hoping that keeping the existing cabinets will save a bundle. They are in great shape and are really functional with slide-outs and built-ins, so it would be a waste to get rid of them. Hopefully I'll get to develop an estimate during class.